In December, Glen and I had many marine adventures in Fiji. The link below takes you to our incredibly privileged experience in seeing manta rays while diving off Kaduva Island with the dive crew from the Matava Eco-Resort. It is thanks to their environmental ethic of this team that these dives are very controlled to make sure the animals are disturbed as little as possible. The video allows us to share all the observations listed below as well as giving you the chance to laugh when you hear my underwater screams of joy when the mantas break from their feeding behaviour, get into a formation of 5 animals and swim by us 4 times! I didn’t even realize I was making these sounds but Glen was there behind me, capturing it on video. That manta rays are big animals. They are the biggest rays in fact; up to almost 7 m across and more than 1,000 kg. The ones we saw are probably about 4 m across. They are very “alien” looking animals. They feed on plankton and small fish and can scoop more food using the two big paddle-shaped flaps (“cephalic lobes”) that are just to the inside of their eyes. You will see from the murkiness of the water that it is thick with plankton. The circular diving pattern of the mantas is believed to help them concentrate the plankton. That manta rays have a relatively short tail for a ray, no stinging spine and you’ll see one animal in the video that has had their tail shredded off, likely by a tiger shark. That sometimes there are remoras attached to the manta rays. These fish may help in removing parasites and have the benefit of transportation, being less visible to predators and possibly getting some scraps as snacks. That mantas are incredibly graceful, having very flattened bodies and big wing-like fins. They can be told apart as individuals. Of course the one with the shark injury is easy to tell apart from the others. There is also one that has had its left fin tip bitten off. But if you look even more closely, you’ll see that each animal has unique markings on their upper and undersides. We passed on our photographs and video for research but, even though they are easy to tell apart, so little is known about them. They are intelligent and coordinate their movements. This is what I found the most fascinating of all, how they knew to all get into a line at the same time and as each of them came by, they were observing me. They pivoted their eyes back to get the longest look possible at the strange creature who couldn’t stop from screaming out in sheer amazement. Click here to see our 8.5 minute video and some related photos. 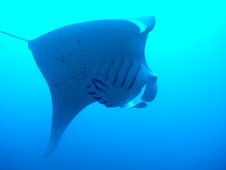 Click here to see a great webpage for more manta ray information. Amazing Jackie! Another spectacular project. I of course think this is fantastic and both kids are so excited to watch your video’s over and over again! A great way to educate! Can’t wait to see more! Wow Jackie that was amazing – I just had to giggle at your excitement, it was ahhhmazing! I would have been screaming the whole time!! Yes Karen, oh fellow lover of the marine, you would have been! Means a great deal to see you “here”. Hello Chance! So glad you like the manta video. Means a lot to me. I heard about the transient orca at Graveyard Point. Do you happen to know if anyone got any pictures so that the scientists could use them for IDs? Big hug.